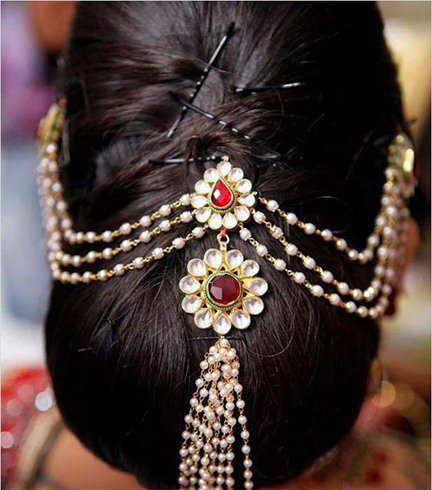 Take a look at some of the most mind-blowing and latest Indian bridal hairstyles! 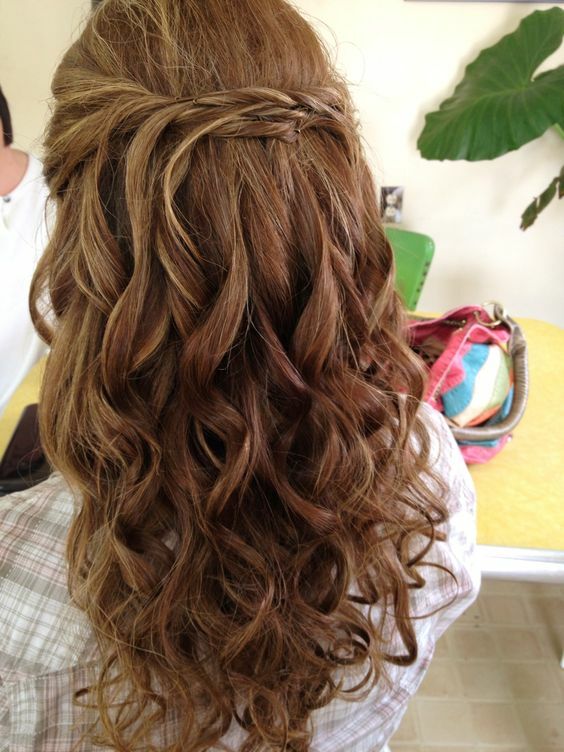 It is always better to plan and practice hairstyles in advance so that there is no last minute stress. Emphasis also needs to be laid on whether the hairstyle matches with the overall look and makeup as well. Traditional hairstyles are very much in this season. 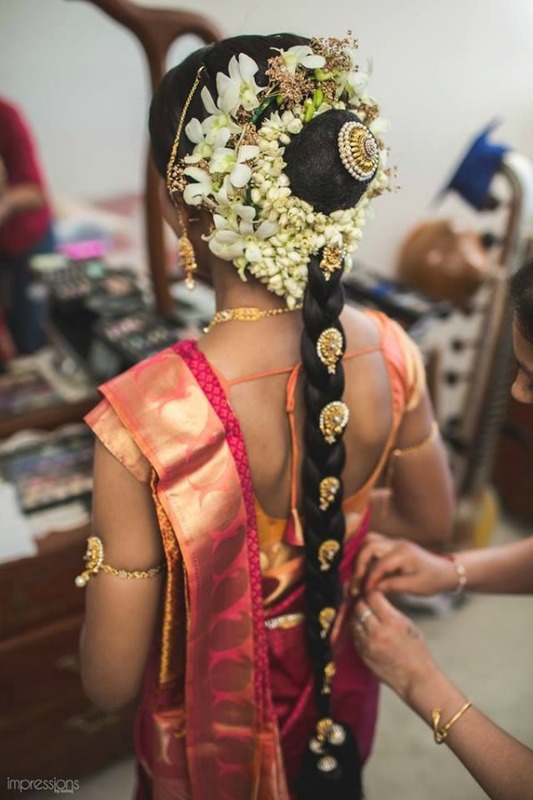 To make the wedding hairstyle look perfect, the bride should take good care of her hair before her wedding like regular oiling, hair spa and proper diet. 1. The Classic Bun: The bun is a classic and has stayed on despite adventurous trends coming up in hairstyles. Part your hair in the middle in the front or back comb it for a huge fluffy hairdo. 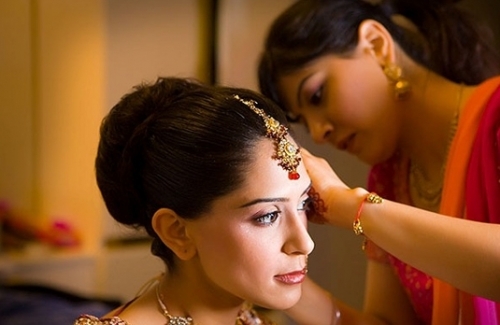 Adorn the parting with a Maang Tikka or with fresh flowers put around the bun. 2. Chic Half Updo: If you have medium length or waist-length naturally curly hair, then this is a fuss-free hairdo. Make sure the curls are loose and spread wide enough to give your hair volume and natural-looking waves. The top of your hair can be set in a pouf so that they don’t look flat. Match your half updo with a lehenga or wedding gown rather than a saree. 3. Curled Updo: Curl up your tresses and pin it up in a loose soft bun. For a softer effect you can leave some strands out of the bun and style it accordingly. Accessories like flowers or a jeweled clip can be added too. 4. The Traditional Braid: A neatly done up braid looks great on round face to oval and triangle faces. In order to keep the braid intact, a holding spray is required. You can ask your hair dresser to put some vintage hair ornaments in case you are wearing vintage jewelry. 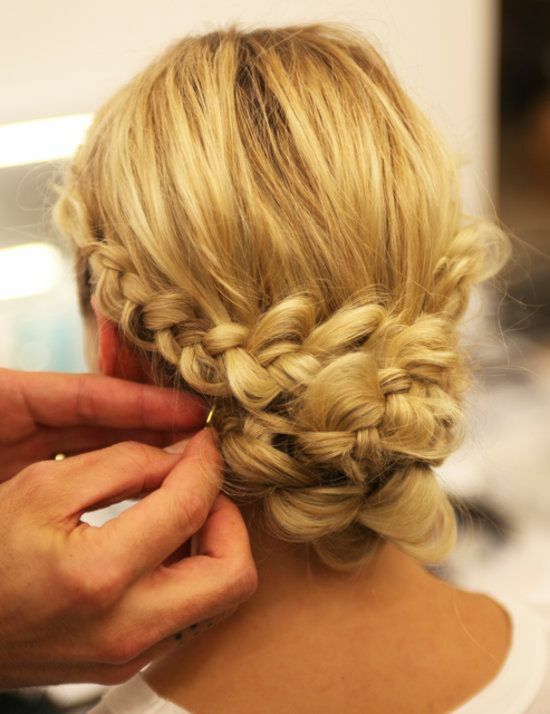 You can add some flowers where the braid starts, but don’t overdo the flowers as they can overpower your hairstyle. 5. Rope Braided Side Bun: The Rope braided side bun is a must try wedding hairstyle for long hair. Take professional help in order to nail this hairstyle idea perfectly. The hairstyle basically starts from the top side of your head – it can be left or right, winds down in a braided style and then it is twisted clockwise and pinned up as a bun. Lots and lots of bobby pins will be needed to keep this hairstyle in place. 6. Open Curls and Waves: If you have them, flaunt them. 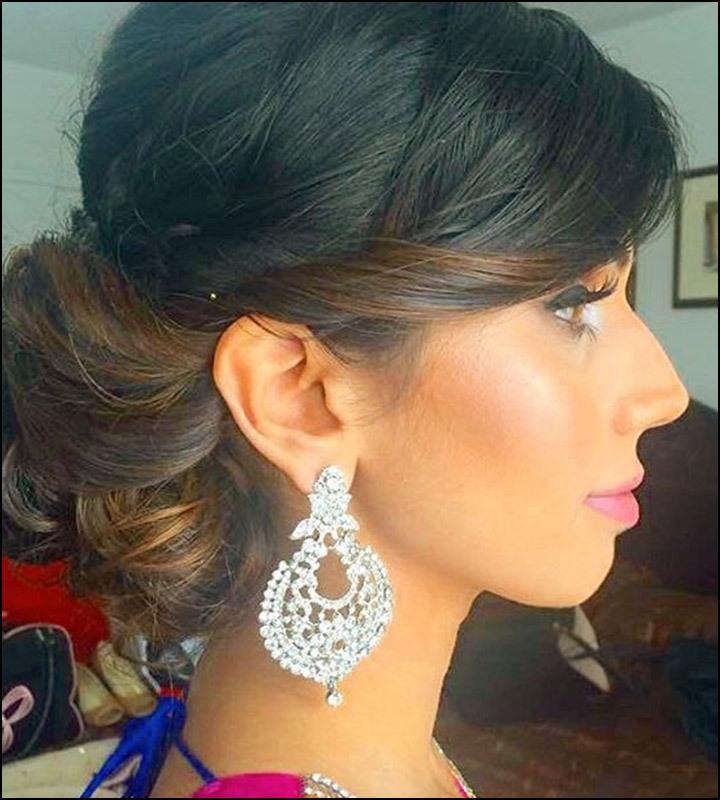 Long hair curled or tousled look amazing for a reception or cocktail evening, Simply backcomb the hair at the crown to add volume and curl from ear to ear. 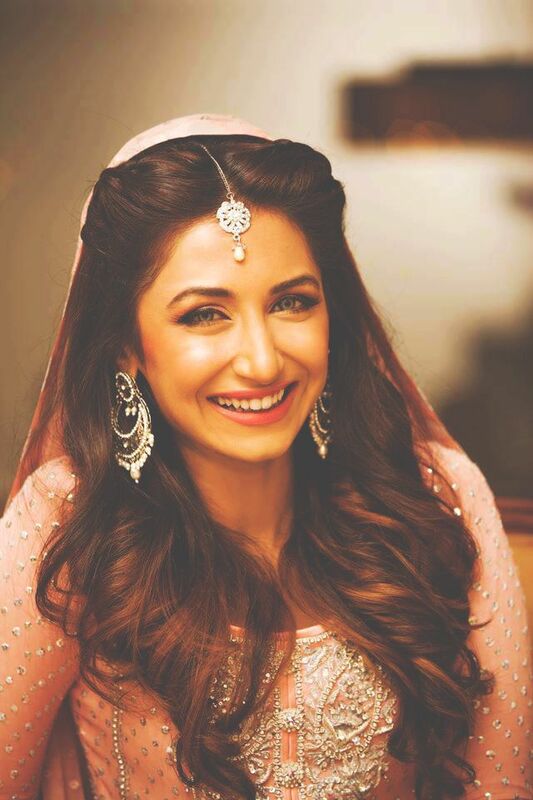 Add a tikka if you opt for a middle parting or a passa if you opt for a side parting. A crystal hair clip also looks really nice. 7. Side Swept Bun: A low hanging bun can be accentuated with a gorgeous side swept hairstyle in front making for a most contemporary and chic look perfect for the modern day stylish bride. 8. 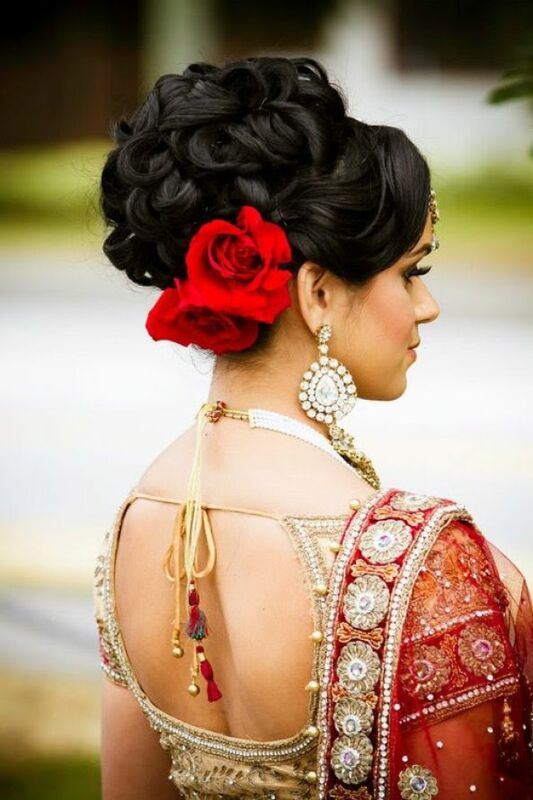 Side Styled Bouffant With Bun: The bouffant and maang tikka combination is a sure-fire stunner, while the large wavy bun with embedded curls worn at the back brings a lot of volume and substance to this gorgeous Indian bridal hairstyle. 9. The Retro Bun: Think erstwhile 60s beauties – Sharmila Tagore, Asha Parekh and Hema Malini. When you take a classic hairdo and give it a contemporary twist with modern methods, you have a truly exceptional hairstyle. Add jasmine flowers to accentuate the hair. 10. Pull-Back Hairdo with Matha Patti: The best hairstyle to show off your matha patti is the pulled back one. The overall clean and neat look also makes a bride look youthful and radiant. 11. A Layered Bun: Adding texture to your hair is a good way to achieve that contemporary chic look that combines the “messy” and stylish elements to excellent effect. Show off with your gorgeous makeup and your stunning jewelry. 12. 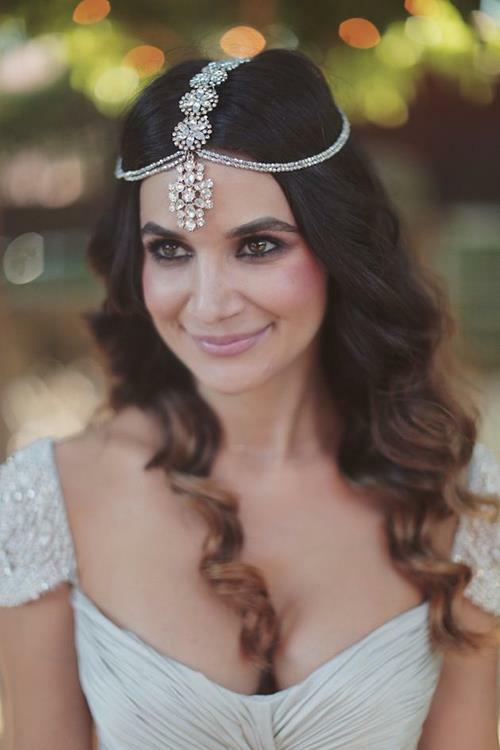 Twisted and Braided Hair With Loose Waves: A bohemian look can also go well with traditional Indian bridal attire, especially for the Sangeet or Haldi functions. All you need to do is to take two thin sections of hair from the front, twist them to some extent and then secure them together at the nape of the neck after braiding up. 13. Middle Parted Curls: Create a center part, volumize the crown slightly and let the soft, luscious curls embrace your face as well as shoulders. 14. 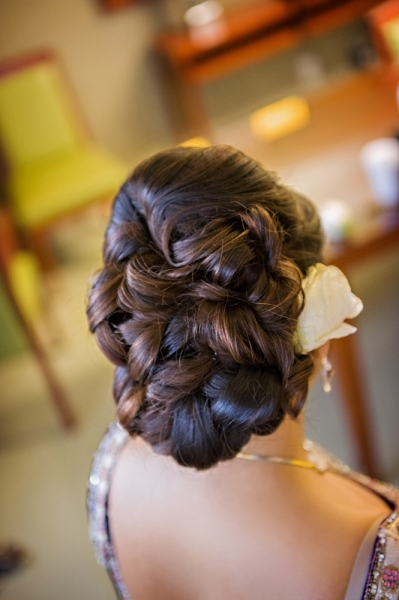 Messy Low Chignon: A huge low chignon is ideal for that special day of your life. You can make it look even more glamorous by adding side sweeps, using accessories and giving it a casual messy finish. 15. Braided Updos: This hairstyle adds height and is great for keeping your chunni or odhni in place. 16. Low Half Moon Bun: Make semi-circular bun and let it embrace the nape of your neck elegantly. 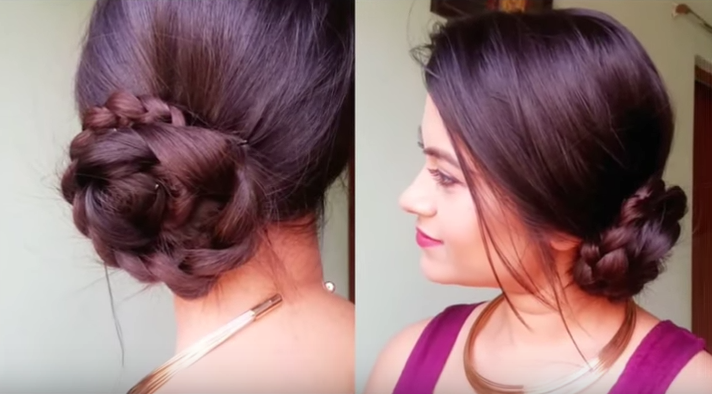 This hairdo would enhance your style when you wear a backless blouse or lehnga or even a cocktail gown.